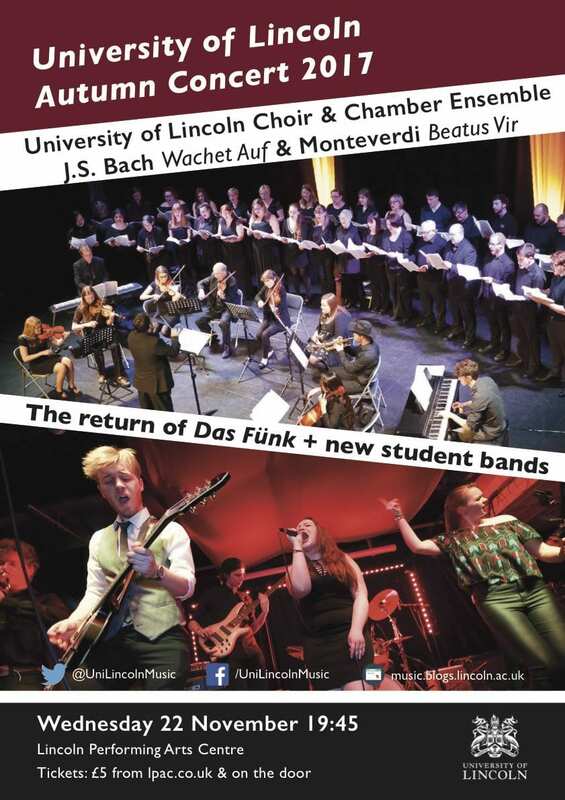 Music at Lincoln | Activity from staff and students at the University of Lincoln music programme. 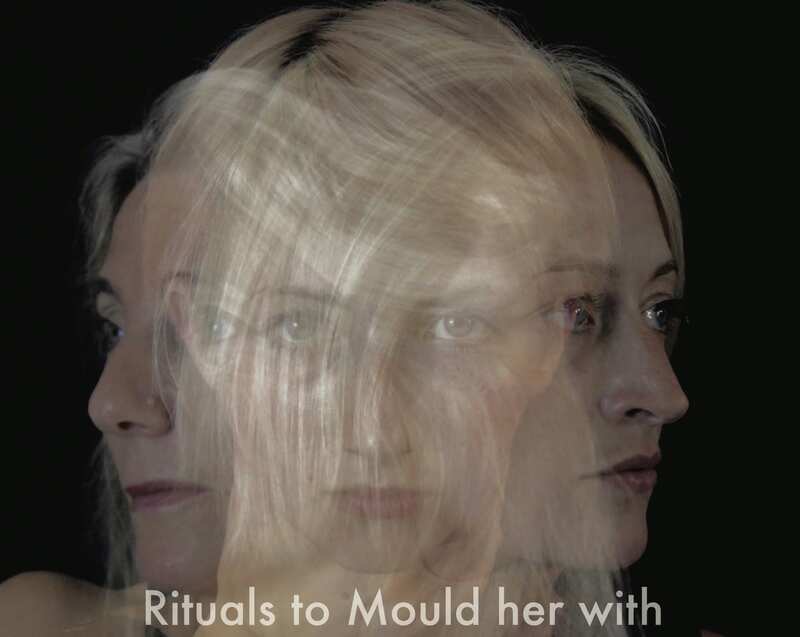 Activity from staff and students at the University of Lincoln music programme. 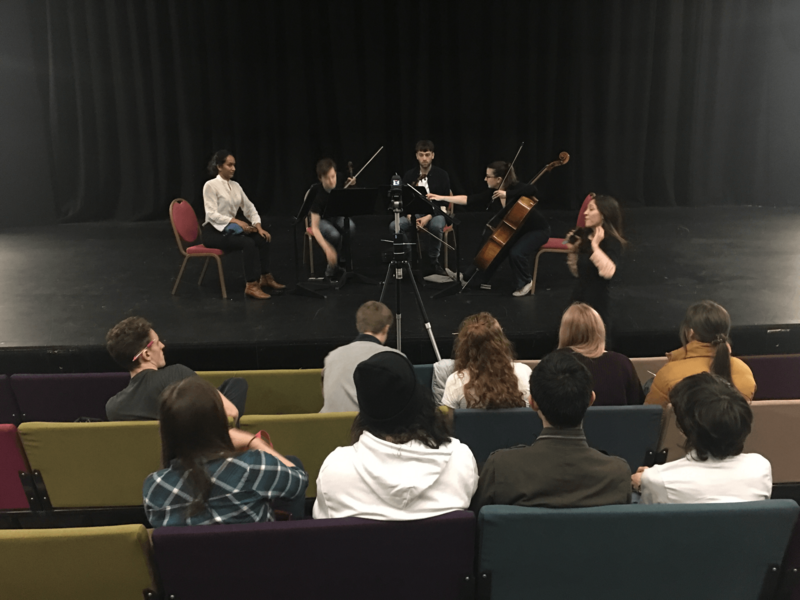 On Thursday 21 February 2019, University of Lincoln’s composition students had the opportunity to workshop their string quartet compositions with the widely acclaimed Ligeti Quartet. Second year music student Reece Mowlem writes about his experience. As a second-year student taking the composition module, last Thursday I was lucky enough to have one of my pieces workshopped by the Ligeti Quartet, one of the UK’s leading string ensembles. Beforehand I felt rather nervous, but the players were all incredibly friendly and quickly put my mind at ease. For each student, they first played the piece through fully before offering some constructive feedback on how the work could be improved, as well as highlighting the aspects they particularly enjoyed. The quartet also allowed us to ask them questions, giving us a chance to receive musical advice, often accompanied by demonstration, from some of the top industry professionals in their field. At the end of the allotted fifteen minutes per student, the group then played the piece in full again, but applying the techniques and changes that had been recommended during the discussion. I personally found the workshop incredibly helpful. In just a short period of time I learnt copious amounts on how to write idiomatically for string instruments, as well as discovering some new extended techniques that I could use to improve my work. The players were able to demonstrate these techniques for me and show how they could be incorporated into my composition. They also gave me a list of composers and pieces similar to mine for me to go away and listen to, which would help me further understand the genre I was writing in. The highlight of the workshop however, was hearing my work being played by a group of such exceptional musicians. They were able to bring it to life in a way my Sibelius playback never could (hardly a surprise!). After the workshop, the viola player, Richard Jones, came over to me and just talked to me about music and composing which I really didn’t expect, it was a very kind gesture. In the evening we were treated to a wonderful concert by the Ligeti Qaurtet in LPAC, rounding off a truly special day for all of us. 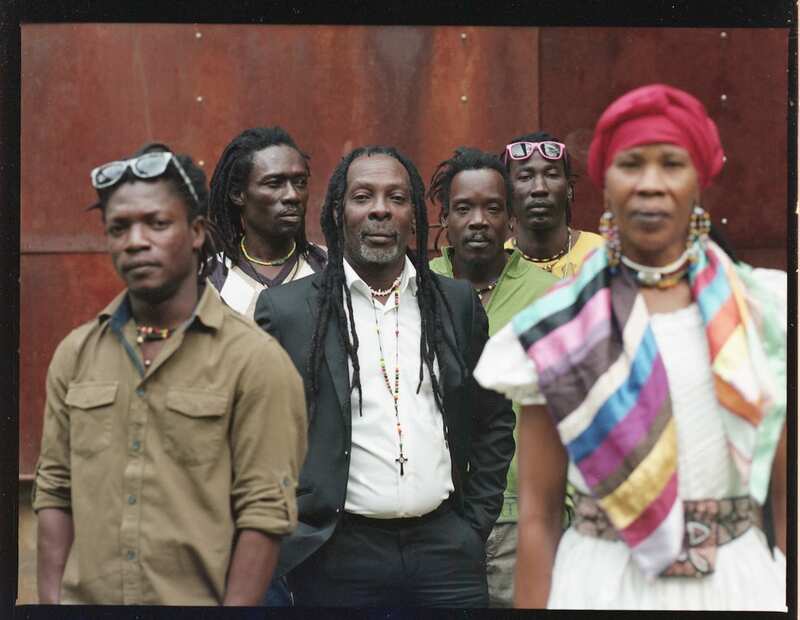 On the 12th of January at Lincoln’s Performing Arts Centre, the second edition of Hidden Gems took place. 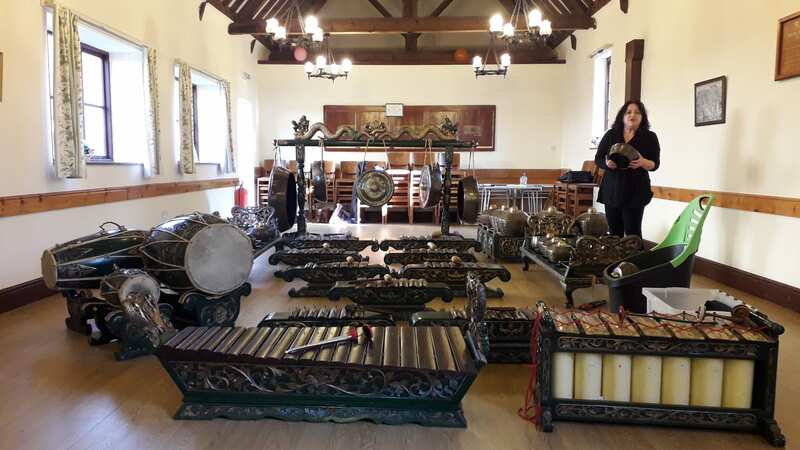 Hidden Gems is an event focusing on the vast array of culture available in Lincoln, bringing it into the spotlight at University of Lincoln for all to experience. This year the Arabic and Anatolian community went all out, creating a truly memorable event. The afternoon started off with an arts and crafts workshop where attendees sat down and created colorful paper items and produced beautiful calligraphy. After the workshop had concluded, everyone moved to the cafe, where food and drink was made available. Curry Jack’s provided amazing tajine, which many were claiming to be the best they ever had. The various Arabic teas available were a perfect accompaniment to the melt in the mouth baklavas provided by the Arabic School For All (ASFA). And for 50p a slice, who could resist just a single try? To access to the main performance space, the audience was required to walkthough an interactive experience. Varying screens displayed traditional dances, food and weddings, accompanied by cookbooks, wedding garments and headscarves, all of which one could admire in detail. Displayed on various tables were decorated tea sets, jewelry and date plates, arranged in a home style environment, giving an insight into some of the home furnishings of an Arabic household. Once people had made their way through the walkthrough display and into the auditorium, the main evening event began, opened by ASFA’s Children’s Choir who performed a lively song in Arabic and followed up by Liam and Jordan, poets from the University of lincoln. We were lucky to have the amazing Çiğdem Aslan Trio performing for us, with a range of music from Turkey and its surrounding countries. The dress that Çiğdem wore, was made by the Universities own fashion department especially for the night! Manal Rawaeh and Amjad Batous graced us with some songs from Syria, playing a brilliant set which was thoroughly enjoyed. Charlie Gualitieri and Jane Simmons from the Outspoken Poets performed some of their original poems. Dr. Taghread Hudaib performed beautiful poetry in its original language of Arabic, accompanied by the translation so that we could understand as well as appreciate the music of the language. Fouad B. performed a short set on the guembri, a Moroccan bass instrument. He announced “I will show you how to play it”, before launching into amazing bass riffs which captivated the audience. The evening closed with a second set by Çiğdem Aslan, who were applauded into playing an encore. We would like to give a special thank you to the Arabic School For All for making the event possible, without their input it would not have been half the event it was. 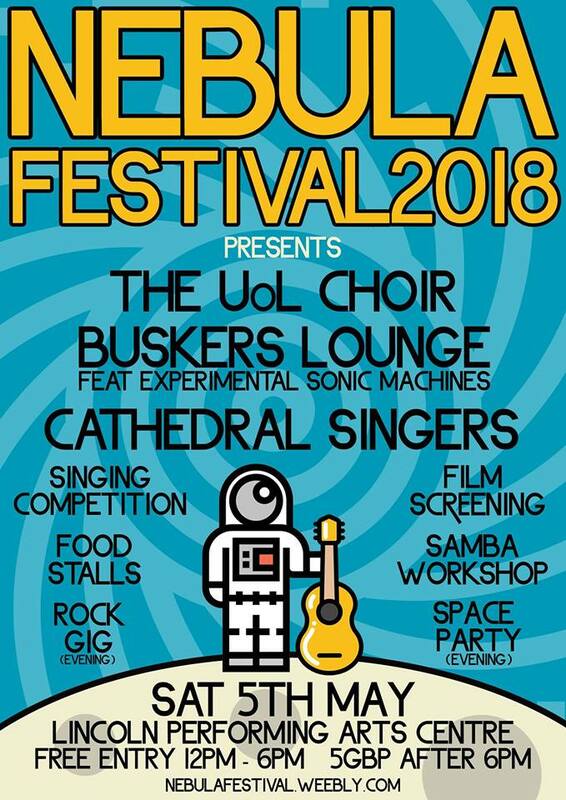 We would also like to thank the University of Lincoln staff and students who made the event possible including the LPAC technicians, the LPAC front of house staff, the fashion department, the music department, the drama department and Rowan Gatfield from the design department who created this year’s magical graphics. And finally, a huge thank you to everyone who came along and made it such a special evening, it was a joy to be a part of. All photos by Sophie Hillman. For more photos of the event please visit her flickr page. 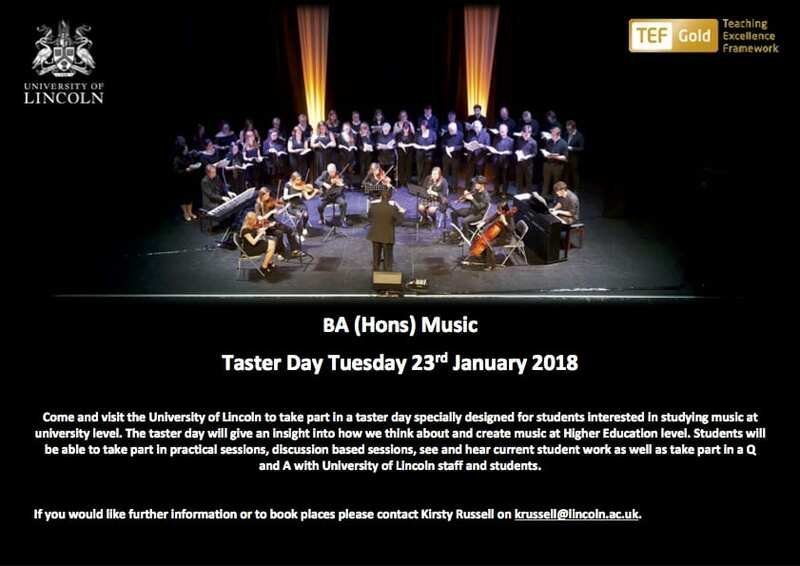 On Tuesday 23 January 2018 the Music Department are presenting a Music Taster Day. The day will give an insight into how we think about and create music at a high level at university. 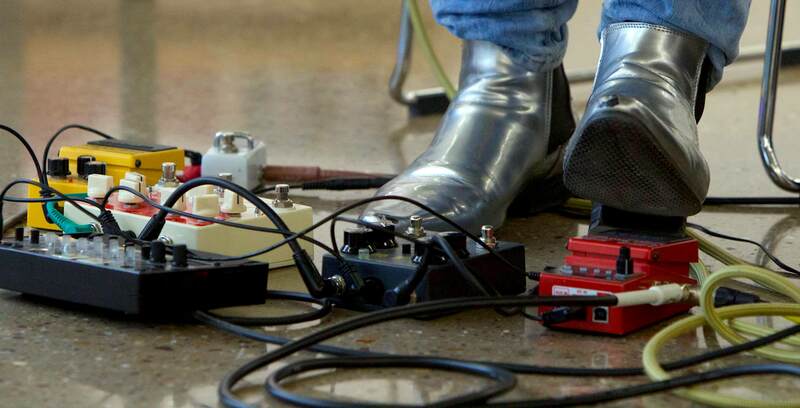 We will explore a big question for musicians and listeners – ‘what’s the difference between sound and music?’ – across three practical and discussion-based sessions. 10:00–11:00 – Is sound music? A discussion and debate session exploring what turns sound into music. Taking the first session to the next level, we explore some creative approaches to making new music. With all the ideas explored so far, we’ll have instruments in hand and get improvising, performing and creating. See and hear some work from current students, and ask them questions about university life and studying music. For more information or to book a place, please email Kirsty Russell on krussell@lincoln.ac.uk.